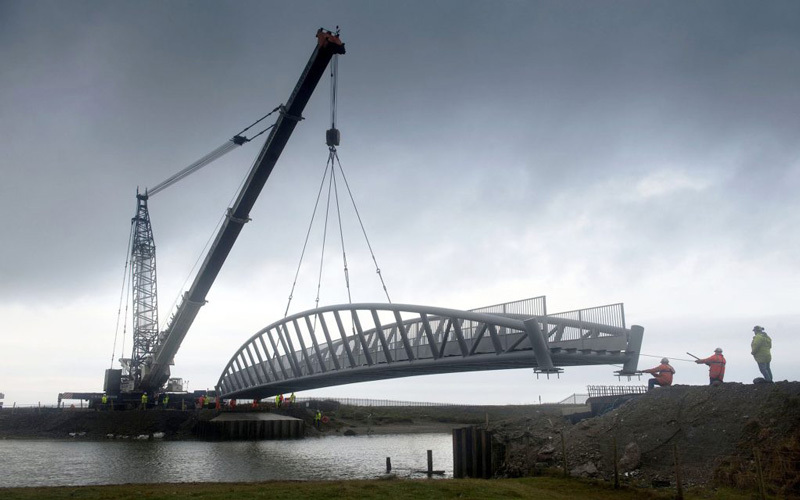 The brief was to provide an equestrian bridge which would span 50m over the Dysynni estuary in Tonfanau North Wales. 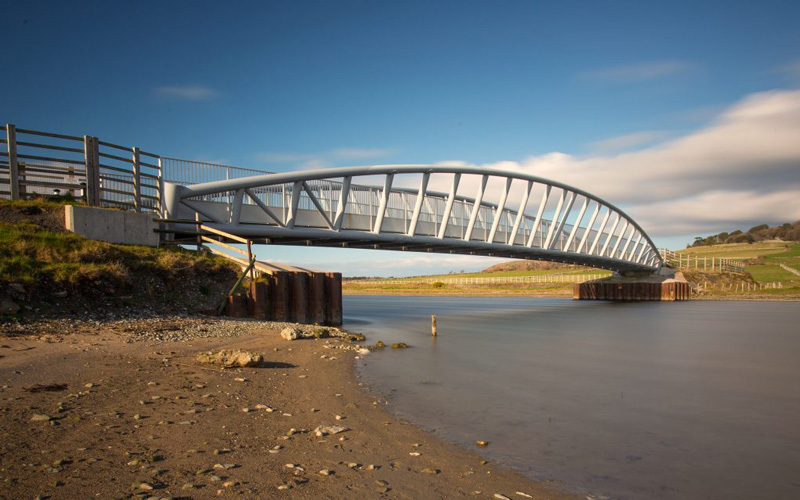 The new bridge, which was funded by Welsh European Funding Office, Traac, Countryside Council for Wales and Gwynedd Council, would be the missing link in the ‘All Wales Coastal Path’ which previously meant a 13 mile diversion inland. YGC’s Structures Team were responsible for delivering the project within a very tight 7 month programme from the project planning stage and conceptual design through to delivery of the final product to the client. As the site is situated in the Snowdonia National Park, close to a Special Area of Conservation, within a SSSI (Broadwater SSSI) within the tidal zone and next to the Cambrian Coast Railway, many consents and permissions had to be applied for in this environmentally-sensitive area. These consisted of Planning Permission (Snowdonia National Park), Countryside Council for Wales Consent (for working within a SSSI and near to a SAC), Marine Consent (for all permanent and temporary works below Mean High Water), National Resources Wales Flood Defence Consent for working in a Main River, Land Drainage Consent, Streetworks permits (for the site and access for delivery of crane and bridge components), HSE F10 and Network Rail permits (for piling and crainage/lifting operations which were to take place within close proximity to the railway). All the environmental obligations and consents were attained by YGC’s in-house Environmental Team who liaised very closely with National Resources Wales and the Marine Consent Unit to ensure that everything was in place before the construction phase began. The client and the funding bodies wanted an iconic bridge which therefore allowed us to be creative and innovative with the design. However, as the bridge was to be sited within the Snowdonia National Park and the beautiful rugged landscape of Tonfanau, the design had to be sympathetic and blend into this rural location. Our intention was to provide a beautiful and striking bridge without being urban or industrial in its appearance. YGC worked closely with the client and the Snowdonia National Park before choosing the aesthetic look of the new bridge whilst being mindful of what was possible within the budget. YGC designed a conceptual open bowstring vierendeel truss which would be constructed of circular hollow section steel tubes. Due to the tight time frame of the project it was decided to let the contract under an NEC3 (Option A) ‘design and build’ so that assistance from the principal contractor (Jones Bros of Ruthin) would be available to achieve a detailed design for the superstructure and foundations. The main bridge lift was planned for the 16/01/2013 at 6:15 am and apart from a few concerns about the wind speed that morning, all went according to plan. 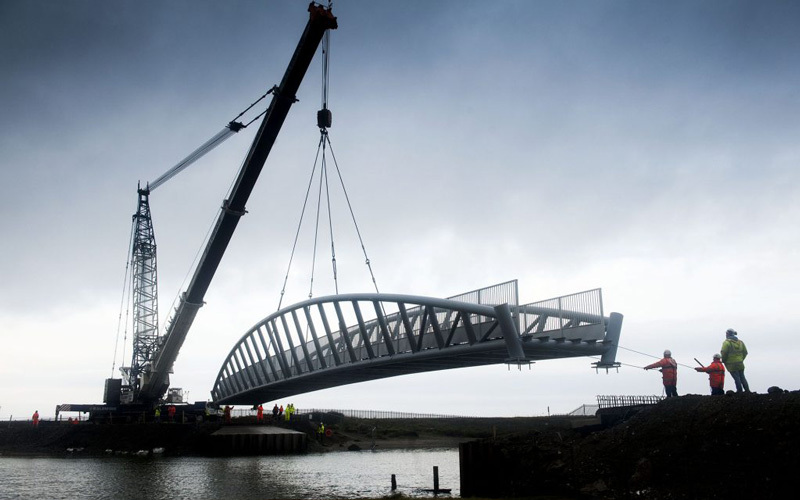 The new bridge has an overall length of 55m and has a clear span of 50m and is the longest span open bowstring vierendeel truss footbridge in the UK.